Yes, “Telemarketing” has a bad reputation. 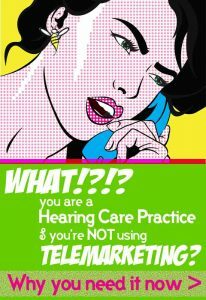 There are a lot of companies out there that give telemarketing a bad rap, but when done right – yes even today – telemarketing is a powerful tool in your audiology / hearing care marketing toolbox. Direct Mail should be the backbone of your hearing aid marketing efforts, but it takes some time to prepare and mail a successful direct mail campaign. But what if you need a boost in hearing aid sales right now? A reputable Outbound Telemarketing program can start sending you qualified leads as soon as the next business day. It is also very cost effective so it’s easier to obtain funds than a big direct mail promotion or online marketing campaign in a short time period. While expensive up front, direct mail is highly effective. When done correctly, a DM campaign will provide a high volume response (and a high volume boost in sales). However, in the hearing care industry, you should never mail a customer more than once in a quarter or you will run into customer fatigue and quickly see your response rate drop. In between the direct mail promotions is an ideal time to use telemarketing to keep those sales numbers consistent. Social media is an essential element of your marketing mix. It gives your brand credibility, let’s you connect with your customers in real-time, and to interact with your customers on a very personal level. However, social media is a long-term investment. It can take a whole lot of time and patience to see sales volume resulting directly from your social media efforts – especially when targeting Seniors. In fact, unless you have a really good plan in place, you may not ever truly know your exact return on investment from your social media efforts. Telemarketing provides a higher volume of qualified leads and in a short amount of time and is easily tracked to provide you with accurate ROI details. You need to diversify your marketing efforts. As we said before, direct mail should be the backbone of all marketing for hearing care, ENT and audiology practices. You also need online marketing (really helps that trust factor) and depending on your market, it is usually a good idea to mix in newspaper, TV, radio and other offline advertising mediums. Outbound telemarketing can be used as a stand alone service to drive traffic to your practice, or as an enhancement to your other advertising efforts. Use a telemarketing service to provide reminders to your direct mail list or surrounding area about a current promotion that you are advertising – whether in print, email, TV or radio. These reminders will greatly increase your response – even up to a 50% lift in response. We talked about how social media can be highly personal, however, nothing beats a live person speaking to you one on one. Consumers, specifically the Boomer and Senior markets, remember and long for a time when everything was done one on one – not automated and online. In a day and age where we are now bombarded by advertisements on web sites and in our email, it is refreshing to receive an actual piece of mail or a phone call from a friendly voice. Don’t believe someone actually enjoys a telemarketing call? A study done in 2012 by the Direct Mail Association showed that while email had the highest return on investment (well obviously… it’s cheap to produce), direct mail and telemarketing response rates far surpassed that of email. Still skeptical? Come sit in our call center for a day. The other day, one of our call agents even had a man ask her to drive to Ohio for a date because he enjoyed the conversation so much. Sad but true, Seniors are often lonely and enjoy having a friendly conversation. This could easily be taken advantage of, which is why we often hear about phone scams targeting Seniors. But, we choose to do good over evil. We employ only the friendliest of call agents (many of them Seniors themselves) and while they are trained to ask particular qualifying questions, they are also trained to provide the utmost respect and friendliness to the person on the other line. After all, our call center representatives are also representing our clients’ brand. So yes… telemarketing can be (and often is) used by the evil doers. However, when used correctly, it can enhance your relationship with potential (and existing) customers, accentuate promotions in other marketing mediums, and eliminate those traditional “down times” – all while being cost effective and providing a quick way to boost your sales. That being said, just like our direct mail packages, our Outbound Telemarketing is not a one-size-fits all. While calling a direct mail list may work for one practice, it may be better to stick to an in-house list for others. Call your Beeman Marketing consultant to determine how telemarketing can fit into your business model.